Bali is one of the closest holiday hotspots to Australia…and the most popular. It’s brimming with Aussies, in fact, there are signs in some areas stating that businesses are “Australian Owned” to draw in the home crowds. In some towns, you’ll even hear people call out “Hey mate” and turn to find a local Balinese talking to you! Besides the throngs of Australians making it feel even more like home, moving to Bali is a smooth and easy changeover. Unless you opt for more off-track areas like the West coast, you won’t feel like you’re in a wildly foreign land. There’s no real culture shock, Bali has most, if not all, of the amenities you’d find at home. Plus, because it has been a tourist destination since the 70’s, most people speak English, making everyday life a breeze. Bali’s climate is hot and tropical year round. The average temperatures hover around 27 C with high humidity during the wet season, from October to April. The dry season, May-September, has the lowest humidity. The mountainous region through the centre of the island is cooler year round. There are various hospitals throughout the island. When in need, most expats stick to the private hospitals as the quality of care and attention to detail are generally more in line with Western standards. The two best private hospitals on the island are BIMC and Siloam, both located in Kuta. For a cold or minor injury, there are local doctors and clinics in every town. There is only one international airport in Bali, Ngurah Rai International Airport, in Denpasar. With direct flights from Perth, Adelaide, Sydney, Melbourne, Brisbane, Cairns, Darwin and Townsville from as low as $200, it makes for a quick getaway. Quantas, Jetstar, Air Asia and Virgin Australia are just a few of the popular airlines that fly regularly. This is the shopping mecca of the island. Whether looking for crafts, art, homewares or clothing, you won’t be disappointed in the variety and artistry of it all. It is also a fabulous international food destination so after working up an appetite from all the shopping or a day at the beach, you can indulge in any type of cuisine you desire. Situated in the southern portion of the island called the Bukit Peninsula, Uluwatu is a surfer’s paradise. Here the rugged coastline gives way to the blue seas and the big waves of the Indian Ocean. Sitting on the southeast coast of the island, Sanur has a reputation for being sleepy, and while most bars and restaurants close at midnight, it’s far from boring. It’s small enough to get to most places on a bicycle but big enough to keep you entertained. There’s a narrow boardwalk that runs almost the entire length of the beach filled with various locations to dine from inexpensive local restaurants, or warungs, to fine dining. 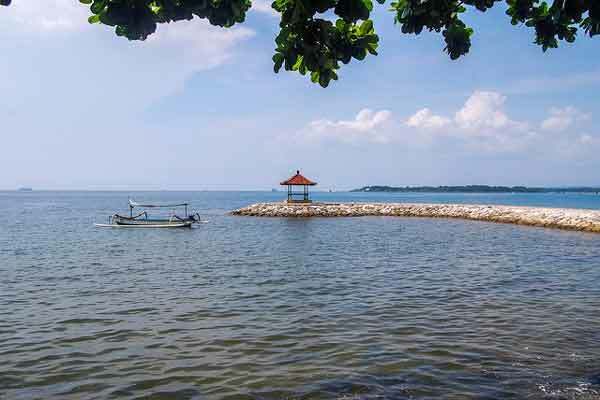 On the northern coast, Lovina is probably one of the least expensive places to live on the island. With calm waters home to pods of dolphins, this not for the surf set, but perfect for divers and snorkellers. It’s a low-key place to catch up on life with nearby attractions like temples, waterfalls and hot springs. An epicenter of the arts as well as the place for anything holistic and mystical, Ubud is often referred to as the heart of Bali. It where you can attend yoga retreats, go vegan and capture your inner designer at a jewellery making class. 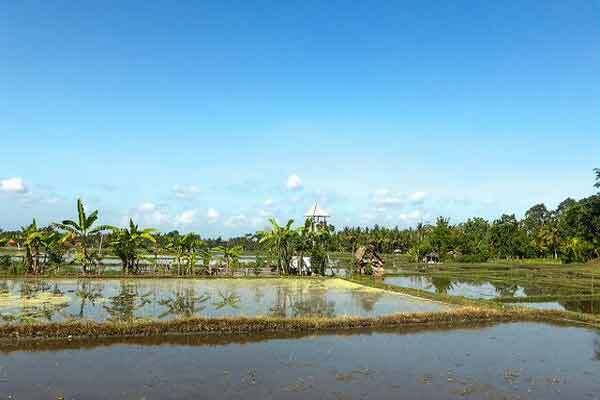 It is surrounded by rice paddies and 30 minutes’ drive to the nearest beach. 1. 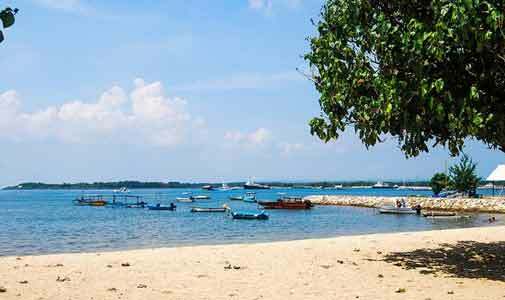 You need a Visa to visit or live in Bali, what type of visa is what needs to be planned. You will enter Bali on a Tourist Visa which is valid for 30 days. If you want to extend to 60 days, you must purchase a Visa on Arrival (VOA) when entering the airport. Then a visit to Immigration will allow you to extend. Alternatively, a 60-day Visa can be organised prior to departing your country of residence via the Indonesian Consulate. Further to this, the Retirement Visa is an option which can give you up to five years hassle free residency. 2. Depending on the Visa you choose, visa runs may be necessary. When a visa expires you must leave Indonesia before purchasing another Visa on Arrival or organising a longer visa. Most expats head to Singapore or Australia, just be mindful of the dates you require and book airfares ahead of time to get the best prices. 3. You do need Health and Medical Insurance. Whether it be Travel Insurance or Expat Insurance, you have to be able to care for yourself in the case of an emergency. Private hospital stays in Bali can be costly and the cost of returning home in a medical emergency can be up to $60,000. Read the fine print and ensure your needs are covered. Theft and traffic accidents are the most important things to be covered for. 4. Bali is located about eight degrees south of the equator and therefore you can expect a tropical, warm and humid climate all year round. There are only two main seasons in Bali: dry season and wet season. The dry season runs from April to September and is exactly that. Hot dry days with brilliant blue skies and a temperature of around 30 C.
The eastern side of the island receives strong winds from June to August—this is when the skies are filled with high-flying kites—and cools things down some. From late October to early March, expect rainy season. In the beginning there are unexpected downpours randomly through the day, but by December to February anticipate extended days of rain and cloudy skies. It’s not cold and everything continues as normal, but I do find I miss the sunshine after a while. 5. 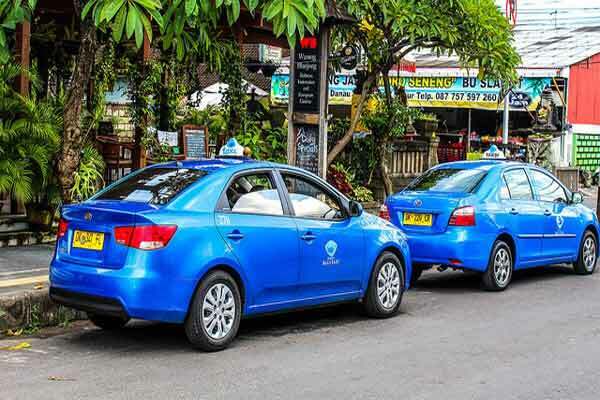 Getting around Bali isn’t hard. With the many taxis and transport drivers about if you don’t want to drive yourself you don’t have to. If you’re going to drive a car here, ensure you have a current international licence. If you’re going to ride a scooter, make sure you’re familiar with the roads and the—admittedly lenient—road rules. Having said that, foreigners on bikes always seem to get pulled over more than the locals! Expect heavy traffic most days in the tourist areas. 6. Current currency exchanges are good value. $1 = IDR10,500 at time of writing. There are fees involved if you plan to use your international bank account and be wary of ATMs that have been skimmed previously. Only use a money changer who has a PT registered number on his sign—usually the ones with the glass doors. If it’s a higher rate than normal, it’s too good to be true. A foreigner is not able to open an Indonesian bank account unless they hold a KITAS. 7. 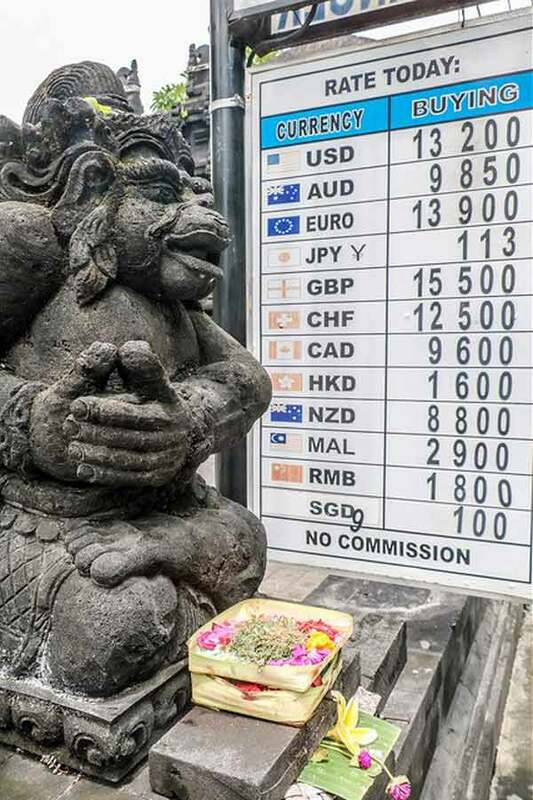 Cost of living in Bali really depends on your lifestyle. Bali is cheap in general, but if you want to eat imported steaks or drink spirits or wine, obviously your budget will need to be higher. Villa rentals are mostly always required to be paid upfront and in cash and this needs to be taken into consideration. If your able to pay upfront for a year or more, you’re able to negotiate a better price saving you money in the long run. 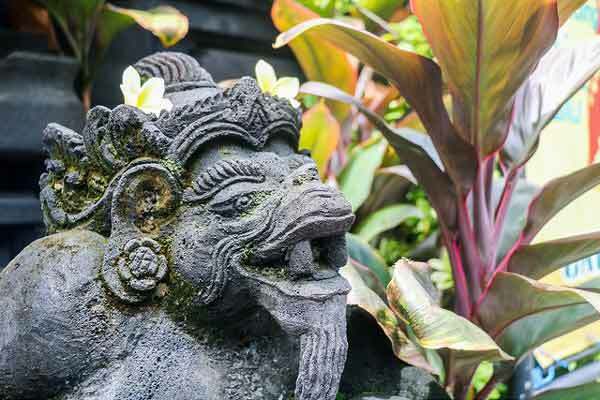 You cannot own a property as such in Bali, some expats do with the help of a local nominee, but it’s not a straightforward process and requires a lot of research. 8. Tradition and culture is very much a part of Balinese life. 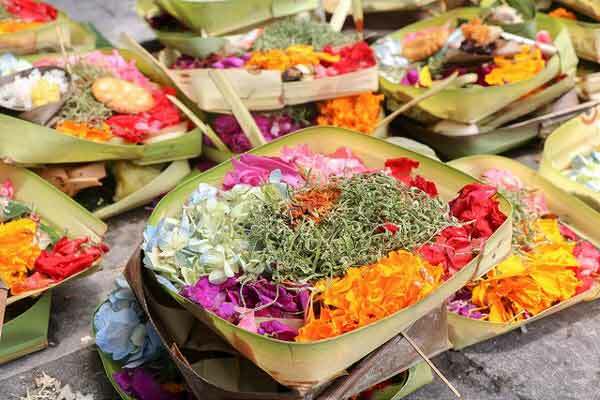 Offerings known as ‘Canang Sari’ are placed all over the paths and roads throughout the day and should not be stepped on. A temple should not be entered without the proper attire and shoulders and thighs should be covered. If you come across a ceremony, don’t stand too close unless you are dressed appropriately and stay calm when you find roads are closed due to a ceremony. The Balinese love you taking an interest in their day to day life but do so with respect. Learn the culture: it’s rude to point fingers and you shouldn’t pat a child or an adult on the head. 9. If you need to take medication regularly, be sure to have enough prescribed before leaving home. Not all medication is available in Bali and while you may get something similar from a local doctor, it may not work the same for you. Discuss with your doctor prior to making the move. 10. Although Bali is much more developed than most Indonesian regions, international hygiene standards are not always met. Consider vaccines before leaving home as most vaccine plans need to be taken four to eight weeks prior to departure. Malaria, Hepatitis A, Tetanus and Typhoid vaccines should all be considered. While Dengue is rife across parts of Bali at different times, there is no vaccine. The best way to prevent Dengue is to not get bitten by mosquitos, so use a good quality repellent. 11. Foreigners are not able to work in Indonesia unless they have a work permit (KITAS). This relates to volunteering also; the rules were relaxed recently with the threatened eruption of Mount Agung. If you’re considering starting or working in a business, setting up a PT company (a foreign owned limited liability company) would be the best way. 12. Moving to a new country isn’t like moving to another state. You’re leaving behind family and friends you’ve known for years and starting all over again so it’s important you get out and meet new people. 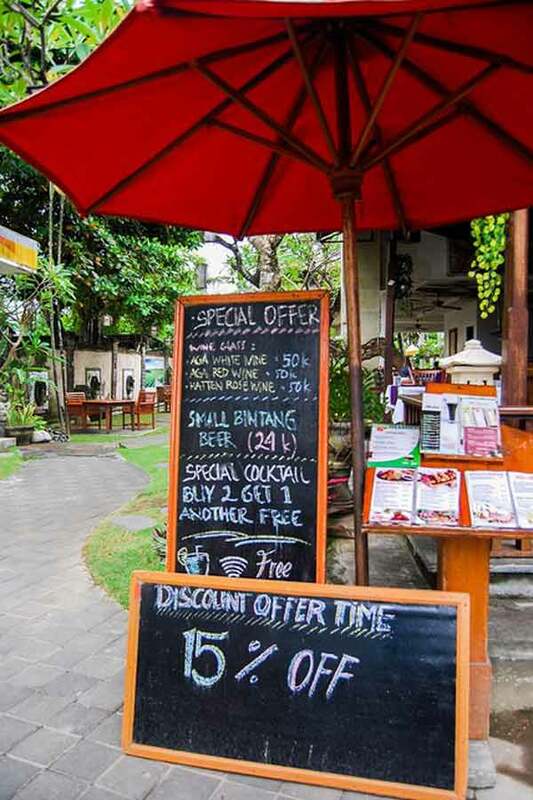 The majority of expats in Bali are welcoming and willing to help you settle into your new life. Include local friends in the mix too, the Balinese love to share their lives and you’ll find yourself invited to weddings and family gatherings in no time. 13. Do experience local food. Indonesians call a small, local restaurant or shop a warung. Sometimes you’ll see rumah makan which means eating home. 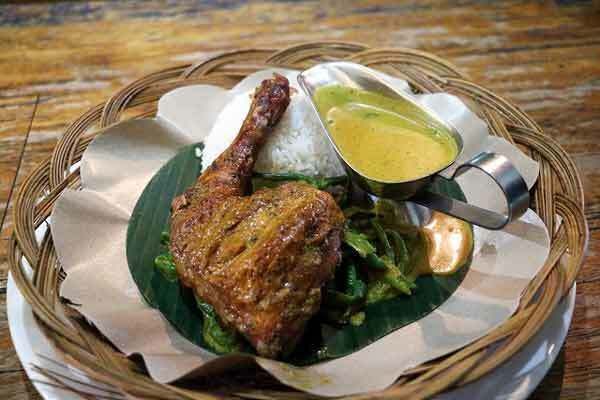 In both you’ll be served traditional Indonesian and Balinese foods in simple surroundings. The food is delicious, cheap and well-worth trying. If you’re new to street-food begin with the more comfortable places first. 14. Learn the language. Of course you’ll get by just fine in English in the tourist areas but even there you’ll find Balinese who cannot speak English well. When you travel north, you’ll find it even more difficult to converse. Take the time to learn Indonesian, even just knowing the basic words will help you to be understood and understand the Balinese when they speak to you. Even if they laugh at your pronunciation, they love the fact that you’re trying. 15. If you live long-term in Bali, you will be required to employ at least one person. Usually a Pembantu is the person everyone goes with. A housekeeper who will come to your home and do chores as directed by you. The average salary for a housekeeper working 20 hours per week is $110 per month. 16. Don’t drink the tap water! You think everyone would know this one, but surprisingly… Brushing your teeth is fine, but don’t swallow the water and definitely don’t drink the tap water. Bottled water is readily available but to help the ever-increasing problem of rubbish, consider using refillable bottles. 17. You need to slow down. Everything is done in Bali time, you soon learn this after living here a short time. If you need maintenance done, 9 a.m. can turn into 2 p.m. Waiting for a meal in a restaurant can take up to 30 minutes. Learn to relax and live in the moment. After working high-paced jobs for over 20 years this was one of the hardest things for me to do. Along with spending almost 24 hours a day with your partner, don’t get me wrong, I love it—but it is a true test of a relationship. 18. Online shopping is virtually non-existent. Sure, you can still access Amazon or eBay, but having anything shipped to Bali is an issue. Parcels normally don’t ever arrive and if they do end up at a post office (Kantor Pos), you have to prove it’s yours and there have been reports of having to pay a bribe. There are sites such as OLX and Lazada, but I’ve not been able to find an English translation. 19. The gorgeous villas you see, with open air living? They exist but be prepared for some critters to share the space with you. Little geckos and big geckos, ants and mosquitos in some areas, like to become your new family. You learn to live alongside them, geckos don’t do any harm, and if anything, they help keep the mossies and ants at bay. The Balinese believe a gecko inside your house is good luck, because it’s considered to ward off evil spirits. Go with the flow! 20. Living in Bali is unquestionably different to holidaying here. Just because you’ve visited Bali 10 or even 20 times it doesn’t mean you know the ins and outs. Living here is a wonderful experience that can be even better if you’re prepared, BUT– no matter how many people you speak to, your own experience will always differ. Sometimes not knowing what to expect makes things easier because you adapt as you go. Living in Bali is definitely an adventure, it’s a privilege to live in someone else’s country and an experience I appreciate every day.